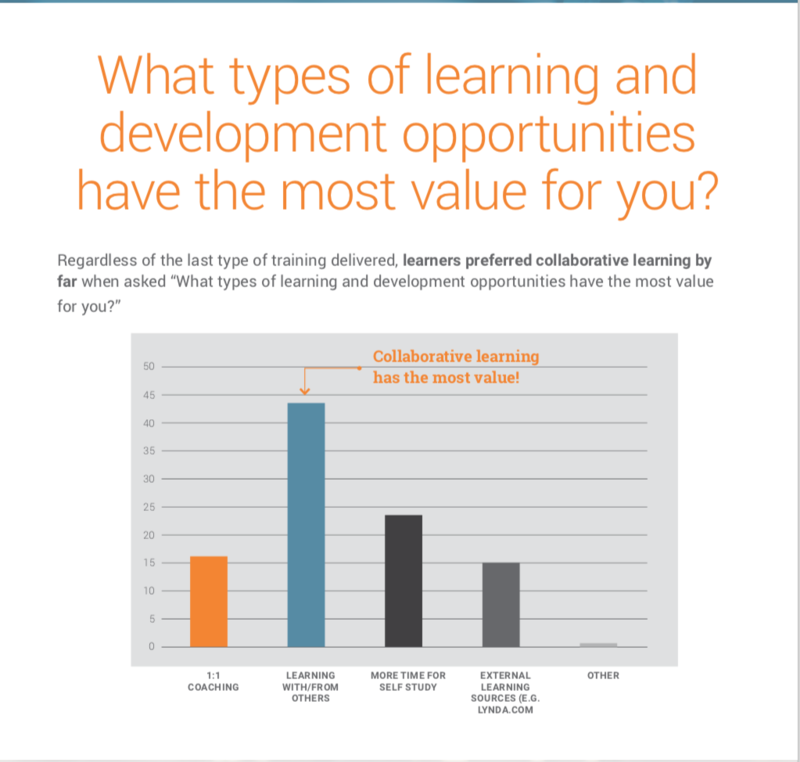 Collaborative learning was, quite literally, the answer to the question “What types of learning and development opportunities have the most value for you?” in our recent State of High-Stakes Learning survey. For example, 31% said, “Not enough opportunities to lead.” Online collaborative learning is a great forum for showing your leadership skills and subject matter expertise. For instance, with the Intrepid platform, you could leverage Missions (work-related assignments) and their corresponding shared Field Reports to showcase your leadership in a particular subject area across the organization. In addition, administrators of Intrepid instances can award badges within the course based on performance outside the course, back on the job. This allows learners to apply new knowledge and skills back on the job, and be rewarded for it publicly within the learning experience. For the 21% who said, “Not enough connections”, online cohort-driven learning experiences come to the rescue again. For instance, as you can see in this case study from a global consulting company, the learning experience connected senior experts with junior associates who now, after taking the program, know who to turn to for specific questions and client challenges. Microsoft also found that “connections” were an important yet unplanned byproduct of the corporate MOOC approach they took for their Business School series of sales and financial acumen courses. Sellers from opposite sides of the globe targeting similar types of customers connected in the discussion forums, and the ideas and collaboration flew back and forth within the learning experience. Microsoft also found that those connections made within the online experience persisted after the course was finished. (You can read more about such things in our eBook Team-Based Learning in the Digital Age). For the 35% who chose “not enough experience” or “not enough hands-on experience at your company”, well, you know what I’m going to say—collaborative online learning has solutions to that too. For example, spaced-out microlearning with company context surrounding generic or standardized information leads to the all-important practice, repetition, application, and reflection cycles learners need to really absorb information. It’s also quite easy to have company-specific context in a learning experience regardless of the source of the primary content. Leaders can upload a quick video explaining how concepts in a week’s content relate specifically to company goals or strategies. Moderators can surface discussion forum themes easily for all to follow. You can download the complete executive summary and infographic of our State of High-Stakes Learning report for 2019, and also keep an eye on our blog for future posts delving in to the implications of the report for corporate L&D.